KIEV, Ukraine -- The Ukrainian government must introduce legislation to address discrimination on the grounds of sexual orientation and gender identity following a number of attacks on individuals, Amnesty International said in a report published today. Kiev's first-ever Pride Parade had to be cancelled because of ultra-right violence in 2012. Lawmakers should also vote down proposed legislation to criminalize the “propaganda of homosexuality”, something that is being debated in Parliament at the moment. “People have been beaten and in one case murdered because of their real or perceived sexual orientation or gender identity. Most of these crimes have not been properly investigated and have gone unpunished,” said Max Tucker, an Amnesty International expert on Ukraine. Nothing to be proud of: Discrimination against LGBTI people in Ukraine, exposes endemic discrimination by officials and members of the public towards LGBTI people. Attacks on LGBTI people are fuelled by negative stereotypical and discriminatory statements from elected government officials and church leaders. Rather than addressing discrimination against LGBTI people, Parliament is now discussing proposals to criminalize the “propaganda of homosexuality,” measures that would restrict fundamental human rights, including freedom of expression and assembly. Antidiscrimination and hate crimes provisions now on the books do not cover sexual orientation or gender identity. Ukrainian authorities do not adequately investigate or prosecute acts of violence motivated by bias. In fact, those working for the police, prosecutors and other government offices routinely express negative stereotypes about LGBTI people, calling into question their willingness to afford everyone equal protection of the law. A Ukrainian non-governmental organization (NGO) received 29 reports of violent attacks against LGBTI people by members of the public in Ukraine in 2012, and 36 reports of threats of violence. It has also has documented 49 cases of human rights violations committed by police against LGBTI people, including illegal detention, blackmail, torture and other ill-treatment in 2012. Armen Ovcharuk, a young gay man, was hit on the head as he left a gay nightclub in Kiev in the early hours of 22 October 2012. His friends reported the crime the following day and an investigation was subsequently started. Armen died of his injuries on 27 October, but so far Amnesty International has received no response from the Ministry of Interior about the progress of the investigation into the attack, or whether it has been recorded and investigated as a hate crime. Mykola Lebed was with friends in a bar in the town of Rivne on 2 March 2013 when he was assaulted by a group of men at a nearby table who had been drinking heavily. His nose was broken and his eyes were blackened. When the police arrived, they spoke to the attackers, but did not arrest them. They reportedly told Mykola Lebed that the assailants were part of a ‘higher structure,’ a phrase that suggests that they were officials from the prosecutor’s office. To date, no pride march of LGBTI supporters has yet taken place in Ukraine. 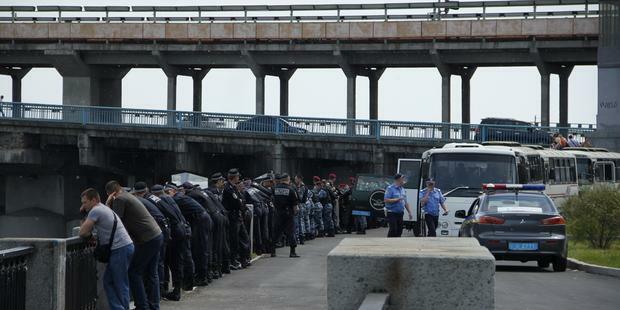 A march planned for last May was cancelled at the last moment because of threats of violence and the failure of the Kiev police to put in place adequate security measures to protect marchers. Immediately after the cancellation, and in the months that followed, some of the organizers were targeted and attacked with tear gas because of their association with the event. None of the investigations into these attacks has been concluded. Other public events by LGBTI groups have been attacked by extremists, with the police not only failing to protect, but rather prosecuting LGBTI activists for exercising their right to freedom of peaceful assembly. “The police must guarantee adequate police protection for LGBTI groups seeking to demonstrate peacefully. 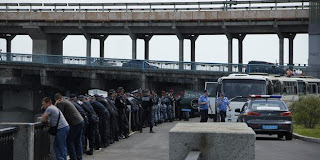 The police’s failure to adequately protect the participants and organizers of last year’s Kiev pride march amounts to a violation of the participants’ right to freedom of assembly,” said Max Tucker. “The police must redress this failure by professionally ensuring Ukraine’s first LGBTI pride march takes place on 25 May in Kiev without hindrance and with adequate police protection. A further failure to protect LGBTI groups exercising their right to peaceful assembly would not bode well for Ukraine’s aspirations to move closer to the European Union.